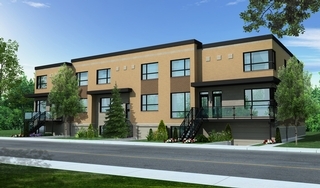 Condos Beaubien Project is located in the heart of the 'Nouveau-Rosemont' borough. This new 12 unit building includes 6 townhouses of either 2 or 3 bedrooms, with yard, interior parking and 6 condos of 2 bedroom unit; With all the commodities and services nearby, the project is located within a few blocks of the Maisonneuve, Joseph-Paré and Francesca Cabrini recreational city parks, a few minutes away from the Maisonneuve-Rosemont and Santa Carbini's Hospitals. This quiet neighborhood is well served by public transportation from which it is easy to commute.